Editor's note: As I was thinking about Sunday's New York Times article about iPhone manufacturing, I e-mailed a few economists to see what lessons they drew from it. One was Andrew Samwick, of Dartmouth, who pointed me to a post at his new blog. There, he stresses, among other things, the importance of "agglomeration": Manufacturers like to build new plans in close proximity to suppliers. So when a bunch of suppliers locate in one place, as hi-tech suppliers have in China, companies like Apple are likely to build their plans there. Another economist I contacted was Gary Burtless, who has appeared in this space before. He wrote me a lengthy e-mail and graciously allowed me to reprint it, in full. It appears below. Finally, James Fallows wrote about these issues several years ago, in a lengthy piece for the Atlantic. It is also worth your time. Charles Duhigg and Keith Bradsher wrote a terrific and informative article explaining “How the U.S. Lost Out on iPhone Work.” I was especially struck by the argument that the United States simply does not have enough trained people with engineering backgrounds to succeed in modern manufacturing. To be an “engineer” in the U.S. typically implies you have accumulated at least four years of formal, college-level instruction in engineering. To do really well in the field you may in fact want to acquire a master’s degree early in your career. There can be little doubt that engineering education in the United States is highly regarded, not only by U.S. employers but by employers and students in the rest of the world. Otherwise, it would be hard to account for the high international demand for admission to American engineering schools and the high demand for the graduates of those schools. What the Times reporters may have had in mind when they suggested there is a shortage of U.S. “engineers” is a shortfall in manufacturing technicians and production specialists. Workers in many technical occupations within manufacturing may need the equivalent of 1 or 2 years of specialized training in a college, private training institute, or community college and a couple of years of practical experience on the factory floor. Workers in these occupations seldom require four years of formal education in a typical U.S. engineering school. The Times story was correct that a number of manufacturing companies report difficulty finding these kinds of technical workers. Steve Jobs, the deceased chief of Apple, and Eric Spiegel, CEO of Siemens U.S. operations, have made this argument. But consider the fate of Eric Saragoza, an engineer at an Apple manufacturing plant in northern California. According to the Times story, his career was sadly interrupted when Apple ceased manufacturing its products in California. Why should an American who has studied hard for a four-year engineering degree, spent a major part of his early career at a successful U.S. company, and been tossed out of work when its operations are moved overseas feel optimism about the prospects of an engineering career in U.S. manufacturing? Many economists and (employed) conservative thinkers may point out that all human capital investments -- and most kinds of careers -- are fraught with risk. An engineer or technical worker in China faces the same possibility of job loss as his counterpart in the U.S. Technology may move on or the product market might shift in a way that reduces demand for what the worker or his company produces. A crucial difference between China and the United States may be that for many Chinese workers, including reasonably well trained workers, manufacturing offers the best job opportunities now available. This is emphatically not the case for young Americans thinking about how they should invest in skills between ages 17 and 30 -- assuming, that is, that they want to enter a reasonably secure career. Mr. Saragoza, formerly an engineer at one the most successful hi-tech companies in history, is now looking for a job that might pay him $15/hour. And the CEOs of America’s great hi-tech companies think that more smart young Americans should be throwing themselves into this kind of occupation? This is a tough case to make to the engineers formerly employed at once-mighty manufacturing companies, such as Kodak, GM, Bethlehem Steel, or Xerox. In comparison to a career as a manufacturing engineer, a job in the education or health sectors, or even in law, might look like a better bet. Those alternatives appear to offer more security and a reasonable chance of decent earnings 25 years down the road. Your place of employment seems less likely to disappear if you work in a hospital, university, law firm, or medical practice. Why is it that one of the most common pleas from hi-tech executives is that immigration quotas should be liberalized, especially for workers with science, engineering, math, and computer backgrounds? If you are a potential immigrant from China, India, Iran, or many places in Europe, the United States continues to offer well paid job prospects for engineers, scientists, and computer programmers … well paid, that is, compared with the job opportunities available in China, India, Iran, and much of Europe. The outlook for an engineering career in manufacturing looks a bit less rosy if you are a smart, ambitious 20-year-old American thinking about the sacrifice required to get a scientific or engineering degree and your career prospects in U.S. manufacturing. A rational 20-year-old might choose a less arduous and risky career path than one that ends with a manufacturing job. The Times reporters persuaded me that east Asia in general, and China in particular, offer an abundance hard-working people with decent skills willing to accept demanding, poorly paid, and boring jobs. 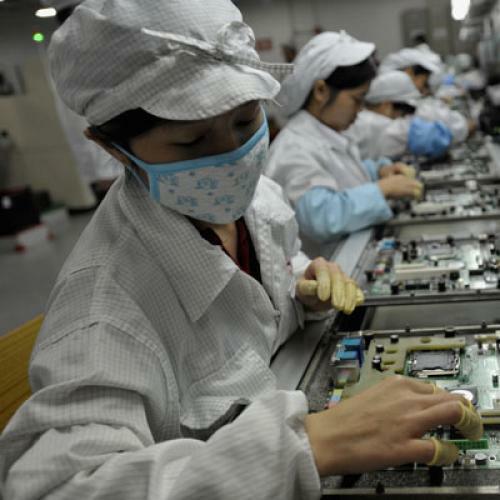 The jobs are acceptable to millions of Chinese, including workers with good technical skills, because the other career alternatives open to them are no better, and possibly much worse, than those in manufacturing. The plain fact is that, for the great majority of 17-to-30 year-old Americans, there are better, or at least less risky, alternatives to a manufacturing career. Gary Burtless is a labor economist at the Brookings Institution.